Every now and then we can look back to a book or article that was published at a time of great change in history – something that affects the entire world – and we see that the author had the ability to lay out the events clearly and with great insight as they unfolded. “The Nazi’s Go Underground” by Curt Riess, written in 1944, is just such a book, detailing exactly what the plan was as the Nazi’s realized they would lose the war – and the plan to continue The Reich from bases in South America and elsewhere. Much of the post-war Nazi experiment has surfaced in a number of valuable books; “Aftermath”, “Martin Bormann – Nazi in exile”, “The Bormann Brotherhood”, and “The Hitler Legacy” for example. While all those books were written years after the war as evidence mounted, “The Nazis Go Underground” was published in 1944, and the official German surrender was not until May 1945. Author Curt Riess saw it as it was unfolding, and had sorted out the espionage networks that the Nazis would use to move their operations around the globe. Before we take a thorough journey through The Nazis Go Underground, let’s take a look at the small article at the top of this text. 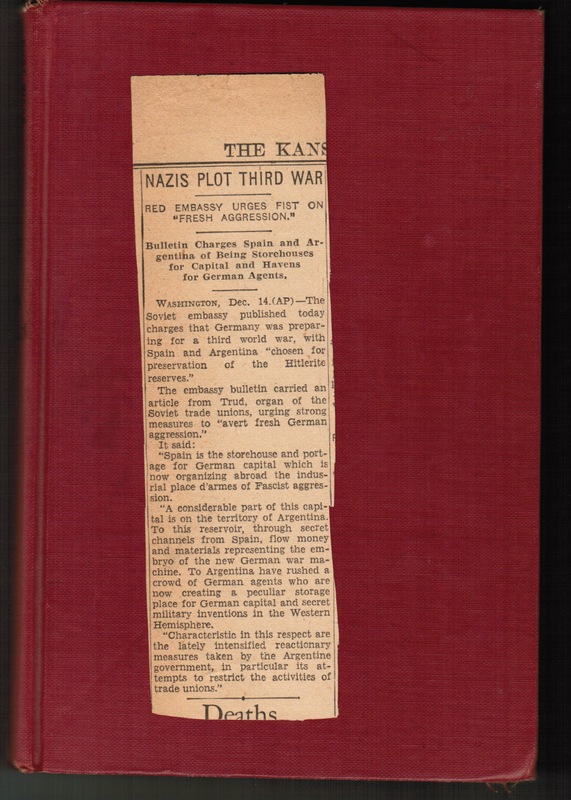 As you can see, it appeared in a Kansas paper, and is titled “Nazis Plot Third War”. This little gem was found as a bookmark on page 190 of my copy of the book, left there long ago by the previous owner. With the help of a reference librarian I found that the article had also appeared in The Cumberland Evening Times, Cumberland Maryland on December 14 1944, The Baltimore Sun on the 15th, The Gazette And Daily from York Pennsylvania (15th), and The Robesonian from Lumberton North Carolina also on the 15th. The article correctly reports that Spain had become the escape route for Nazi agents destined for Argentina, some of the very same information Curt Riess presents in The Nazis Go Underground. What we will see here, is the obvious fact that the relocation of high Nazi officials and their flight capital was a protected operation, with many being incorporated into U.S. Intelligence services and assisting U.S. operations in Latin American dictatorships. While author Riess did not foresee such collaboration, he clearly identifies Nazi networks on American soil and sets the stage for the global German power structure – The Underground Reich. “Curt Riess, a refugee from Nazi Germany who returned as an American war correspondent to record the demise of Hitler’s Third Reich, died on Wednesday at his home in Switzerland. He was 90 and lived in a suburb of Zurich. A former Berlin journalist, Mr. Riess drew attention in the United States in the 1930’s and during World War II with his books and widely syndicated reporting about Hitler’s Germany. For instance, “The Nazis Go Underground” (Doubleday, 1944) described German espionage and what designs Hitler’s associates might have for overseas after a defeat. Wrote About Resistance. With Hitler’s rise to power, Mr. Riess left Germany for Paris. In 1934, Paris Soir, one of the Continent’s largest papers, sent him to the United States. In the following years he shuttled between London, Paris, New York and Hollywood as a freelance journalist. He was in Berchtesgaden, Hitler’s favorite retreat in the Bavarian Alps, when the war ended. He then worked in New York and returned to live in Germany. He moved to Switzerland in 1952. Riess begins chapter one with the heading “The party must go on”, meaning of course, The Nazi Party. In fact, he gives the actual date he believes the party went underground as May 16 1943. According to Riess, the Gestapo split into two groups, with the second team being relocated to a large estate in Berlin-Grunwald. Himmler’s Gestapo was chosen to lead the underground Reich movement because of it’s superior organization. It seems that Himmler collected books on and made a study of secret societies, including The Bavarian Illuminati and the Carbonari in Italy. After the Beer Hall Putsch, the Nazis adopted the secretive “cell structure” of revolutionary movements, which they learned from the Italian Carbonari. Around this time, Himmler and Martin Bormann team up to organize the underground. Chapter 2 provides details on German industry such as early attempts to divorce industry from Nazism, though German industry clearly sided with the Nazi party’s stance on no unions and favorable tax rates. As American industry was heavily invested in the growing German economy (Ford, G.M., IBM, The Hamburg-America Shipping line, Thyssen steel etc.) the Americans realized the importance of keeping German industry intact so that Allied industrialists would still have their hands in profitable post-war business. Author Riess provides great detail on the banking interests run by people like Horace Greeley Schacht regarding the building of the Reich as well as international war-time trading and the role of Nazi banking and the Underground. International trade was conducted with the Nazis before, during and after the war through The Bank for International Settlements in Basel, Switzerland. In fact, in a 1934 speech Montagu Norman of The Bank of England called the Nazis “A great stabilizing force”. Norman actually gave Schacht control of all the Czech gold held on deposit in The Bank of England. From here, author Riess gives us a little backstory of German cells within the military. For instance, as German victory appeared bleak, Himmler attempted to infiltrate the SS into all army offices. Decades earlier, Major Kurt von Schleicher had started what was called The Underground Imperial German Army – The “Black Reichswehr” and “Freikorps”. The Black Reichswehr was composed of assassins and nuts, and this “army within an army” was illegal at the time. By 1942-43 The German army was hopelessly stalled on The Russian Front. A General Mannstein took control of the German army and began to wind down the war, apparently with no interference from Hitler. 1942 also saw the American invasion of Algeria, and Riess sketches out the various rebel French Generals and associated fascists double-crossed the Gaullists and Jews that had supported the American invasion. There had been a collaboration between German and French fascists through “The Franco-German Trust”, a French Trans-African company formed in 1941 to control raw materials, under the guidance of mega-industry giant I.G. Farben and Deutsche Bank. At this time, the emerging Nazi Underground witnessed the Americans working closely with French fascists, something they would find very useful in the future. As Riess describes, Italian and German fascists during reconstruction were suave and spoke English. The anti-fascist rabble were poor, spoke no English and were so beaten down they were difficult to deal with. U.S. Officers were quite at ease with the elite fascist class in the post-war reconstruction. This entry was posted on September 8, 2016 at 5:00 pm and is filed under Book review, Hidden History. You can follow any responses to this entry through the RSS 2.0 feed.